Hello from Italy! Mark and I saved up our airline miles, and got free tickets to Italy, in part for a vacation, which we have not had in years, and in part to investigate whether it would make sense for us to make a film about the complex coop economy that is here, in some dimensions richer than what we saw in Mondragon, and with valuable lessons for people in North America. Coops are so widespread as to be taken for granted here. We’d tell people we’re here to learn about the coops and their response would be, “so, what’s the big deal.” They have been well established since the mid 1800′s, and were long identified with political parties – socialist/communist ones, Christian Democratic ones, etc. Now the different threads are working closely together and dismissing past political quarrels. We have done some filming, visited some coops and our heads are full of information to assimilate once we get back home. I’m afraid we have also been eating way too much absolutely wonderful food. 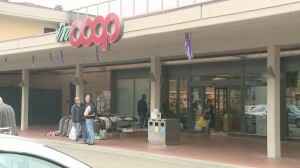 Speaking of food, the largest supermarket chain in Italy is COOP, a system of 115 consumers’ cooperatives of various sizes (9 large, 14 medium, and 92 small), with 1,444 shops, 56,682 employees, more than 7.429.847 members, and an annual revenue of €12.9 billion. COOP illustrates something distinctive about Italian cooperatives, which build networks of coops in a given industry – retailing, construction, etc. so that each coop can remain relatively small and responsive to its members while together they achieve certain economies of scale and a national brand identity. Seems to work very well. Another type of coop here is the social coop, an Italian invention dating from the 1980′s. While we see efforts to cut and privatize social assistance programs in the U.S., which are in some measure in response to real problems of bureaucratization and decline in quality of service, in Italy the government is addressing the same sorts of problems by collaborating with social coops to deliver services. That way the services are still socially minded, rather than driven by profit, and the coop members protect their own professional and monetary interests. With the help of Ian Richard from the U.S. we visited Ecosphera, a social coop that does recycling, maintenance of outdoor spaces and a recently founded ecologically focused small shopping center. Some of their members are people with learning or physical disabilities, or are re-entering society after prison or drug issues. Coops are privileged in the post-WWII Italian constitution and they get special tax advantages and priority on government contracts. 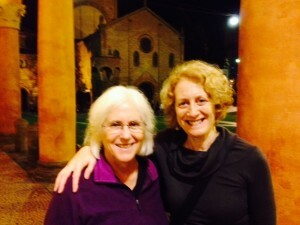 Ran into an old friend on the street in Bologna, visiting Italy on a Food First tour. We interviewed an economist who specializes in cooperative history at the University of Bologna – oldest in Europe – and visited Aster, a high tech consortium, a large networking organization called Legacoop, and Voli, a coop of radio and film producers with whom we discussed how we might collaborate if we decide to return to make a new film. As of now we certainly hope we will be able to do that. Thank you for sharing about your Italy and Spain visits. I do hope you are able to make another film about coops in Italy. My husband and I are helping to bring Shift Change to Sharon, MA in February through the social justice committee at the U Church. We look forward to seeing it. 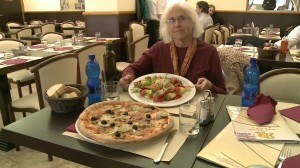 I encourage you all strongly to document the Emilian co-ops, especially social co-ops involved in social care (See Ch. 5 in Humanizing the Economy, by John Restakis). Given aging U.S. demographics and un/under-employment, we should reflect deeply on market opportunities, with institutional allies, to develop together needed social care co-ops. Perhaps documentation could explore: a.) Italian governmental collaboration, and, b. )Cooperative Home Care Associates (NY City, http://www.chcany.org). Perhaps this could parallel your good documentation of Cleveland, Ohio initiatives, with anchor institutions. Thanks. « Help Get SHIFT CHANGE on PBS Stations Around the Nation!